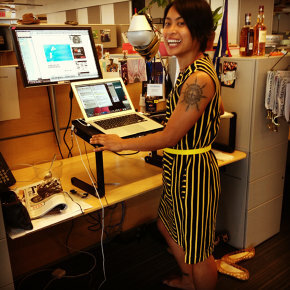 Fast Company Web Producer Cia Bernales made the switch to a standing desk a year ago. She shares why she’s never going back to a regular office chair and how her posture got a new angle. I came into the Fast Company office one April morning last year and crafted a makeshift platform for my laptop and secondary monitor from discarded Ikea side tables so I could try standing while I worked. People were naturally curious when they saw my new setup and started to bet that I wouldn’t last at my new standing desk for more than three months. Trash-talking ensued and money and offers for dinner were promised. It was on. I had to stay standing just to prove everyone wrong. I was first introduced to the idea of standing desks months earlier when visiting a friend in Los Angeles and saw her husband’s standing desk setup in his home office. He stood at his desk all day, doing the yoga tree pose in between to give one of his legs a break. He loved it and told me that his posture had improved. I was sold. My lower back and my shoulders always felt tight at the end of the day and I usually felt fatigued on my way home from the office even though I eat fairly well and exercise regularly. Turns out there is research to back up my feelings–in fact sitting for a long period of time is so bad for you that some have called sitting the new smoking. On the first day, I definitely felt that my body was protesting from standing for several hours. My legs felt numb and my lower back felt tired. It was so bad that on my way home during rush hour, I pushed an elderly woman out of the way so I could get a seat in the subway. But I persisted. I thought of the ceviche and the cash at the end of the line. I kept standing. After a week, executive editor Noah Robischon took pity on me and bought a chef’s mat to provide relief to my feet. The cushion definitely helped but at times I found myself marching in place to keep my blood flowing. Our office manager soon followed with a crank to attach my monitor to my cube’s wall that allowed me to adjust its height, and a desk tray to put my laptop and mouse high enough to keep my arms at a 90-degree angle. My early standing desk setup using a monitor crank and a desk tray. With standing came the natural inclination to avoid slouching. I kept reminding myself to march in place, do side bends and stretches and sometimes even squats. Since I was already standing I found that I walked around the office more, taking more frequent, short breaks. Soon, I was okay skipping my monthly lower back massages. Sure, I still wanted to sit during meetings and when commuting to and from work, but I started to prefer standing eight hours during the day. Before when I was sitting at my desk, it would be hours until I realized I had been hunched over, or what my colleague Jason Feifer calls “Thrillering” or “T-Rexing.” My shoulders would always feel tense because I tended to scrunch them up towards my ears. When I stood to take a break, my legs would feel numb for a few seconds because I have not shifted from my sitting position in hours. Fast-forward to June, three months after I made the bet–I was still standing. I pocketed the $40 wagered against me and was rewarded with an expensive dinner. No one has made a bet against me in the office ever since. But even after the bet ended I kept standing. I was converted. Then recently I discovered a new approach to my standing desk. One day, while making coffee in our office kitchen, I noticed Mark of the New York Focal Furniture showroom packing away the Locus Seat. He was in the office for another appointment but I convinced him to check out my standing desk setup. To my delight, he agreed to leave the Locus Seat for me to try for two weeks. It only took him a few minutes to teach me how to adjust it properly and how to stand and lean on it correctly. The first day required my body to readjust. My feet no longer carried my entire body weight. My weight was distributed from my lower back down to my thighs, my calves, and my feet. My weight was distributed from my lower back down to my thighs, my calves, and my feet. I was leaning back rather than standing, forcing my spine to be in a neutral position. It seemed unsteady at first, but once it was adjusted to my height, I was able to sway side to side without worrying about stability; the pivoting seat actually helped me adjust and encouraged me to move. It was like getting a core workout with going to the gym. When I was just standing, I always removed my shoes so as not to stand on my mat with shoes on. With the Locus Seat–though still not ideal–I was able to keep my shoes on since my feet were just pushing and resting on a mat, rather than standing directly on it. Two weeks of leaning on the Locus Seat made me realize that, even though I loved standing at my desk, my feet liked the relief. Because I don’t have to adjust the height of my desk, I could switch from standing and leaning throughout the day. The side bends I was doing while leaning were also refreshing; it was like stretching without interrupting my workflow. The only problem? The Locus Seat isn’t cheap–it’s about $650 retail. My standing setup didn’t cost me anything, and anyone can craft a similar one very easily without spending too much money–just buy an inexpensive side table (similar Ikea tables to the one I use are under $20) and adjust the legs for the right height. Put two side-by-side and you’ll have plenty of room for your keyboard and mouse and they’re more stable than a desk tray. One thing I’ve decided for sure after a year of standing–I’ll never go back to sitting. I would bet you on that.